Le Giornate piangono la morte dell'amico David Shepard, storico, restauratore, collezionista, docente universitario, fondatore della Film Preservation Associates, vincitore nel 1993 del Premio Jean Mitry. David – che avevamo conosciuto nel 1986 quando accettò la proposta di Lorenzo Codelli di organizzare anche a Pordenone un omaggio per il cinquantenario della Directors Guild of America – era venuto per l'ultima volta al festival nel 2011, ma anche nel 2016 ci aveva aiutati, con la sua solita generosità, a trovare film che sembravano introvabili. Non a caso negli anni Settanta aveva lavorato con la Blackhawk Films, acquisendone nel 1989 l'intera collezione, come lui stesso ricorda nell'intervista che nel maggio del 1990 gli fecero Livio Jacob e Russell Merritt, "La prima volta che vidi Traffic in Souls"pubblicata in italiano e in inglese su Griffithiana38/39. "The Night I saw Traffic in Souls: An Interview with David Shepard" by Livio Jacob & Russell Merritt, Griffithiana 38/39 (1990). Susan Dalton, amica e storica collaboratrice del festival, è morta sabato 30 novembre 2013. Aveva 69 anni e da 35 era l'amatissima compagna dello storico Paul Spehr. Esperta di catalogazione e preservazione, era stata a lungo responsabile dei Preservation and Archival Projects, National Center for Film and Video Preservation dell'American Film Institute. Senza di lei non avremmo mai potuto realizzare la retrospettiva "Sulla via di Hollywood" che nel 1988 contribuì a lanciare internazionalmente le Giornate. "Susan Dalton, my companion, best friend an wife died Saturday, November 30th. She did well through surgery but the pneumonia which had plagued her for the past year flared and though she resisted stubbornly, she could not survive. We have shared 35 wonderful and exciting years together and enjoyed the fellowship of so many of you who will read this. 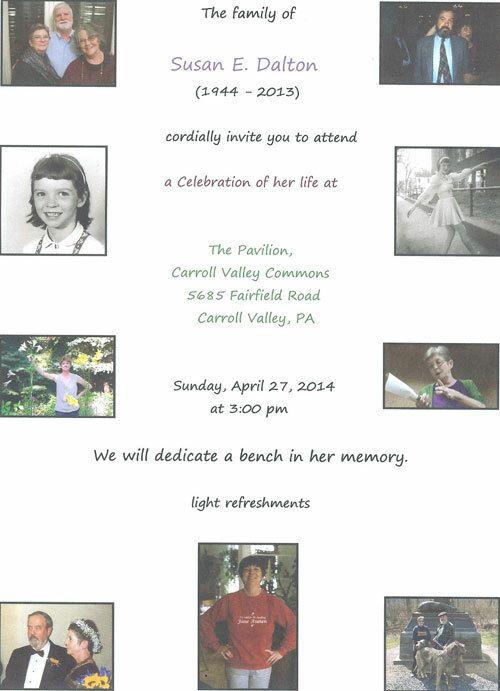 I know that she would appreciate your thoughts and concerns and good wishes – as do I." Susan was one of the earliest friends of the Giornate. Without her, we would have never been able to do the "Before Hollywood" programme that launched Pordenone's international reputation in 1988. Sara ha collaborato con le Giornate per 16 anni, seguendo in particolare l'Ufficio Stampa, la promozione e le relazioni con le istituzioni locali. Aveva cominciato nell'ottobre 1995 come guida della mostra "Luce e movimento"; la sua ultima mail di lavoro ce l'ha scritta l'ultimo giorno del 2011. Appassionata di Dickens, ai primi di dicembre, quando sembrava star meglio ed eravamo andati a trovarla nel suo bell'appartamento di Pordenone al termine di una riunione del direttivo, era stata felice di apprendere che le Giornate 2012 avrebbero celebrato il bicentenario dello scrittore con una rassegna a lui dedicata. Non conosceva però Le due città. Gliel'abbiamo procurato, ma il tumore contro cui combatteva da giugno non le ha dato il tempo di leggerlo. / For 16 years Sara collaborated with the Giornate, working particularly with the Press Office, promotion, and relations with local institutions. She began in October 1995 as a guide at the exhibition “Light and Movement”; she wrote her last work e-mail on the final day of 2011. Passionate about Dickens, in early December, when she seemed to be better, we went to see her in her lovely apartment in Pordenone after a meeting of the Festival Board, and she was so happy to learn that the 2012 Giornate would celebrate the bicentenary of the birth of the great writer with a retrospective dedicated to him. She however was not familiar with A Tale of Two Cities. We got it for her, but the tumor against which she had battled since June did not leave her the time to read it. Miriam Bratu Hansen died on February 5, 2011. She had been Ferdinand Schevill Distinguished Service Professor in the Humanities at the University of Chicago in the Department of English and the Department of Cinema and Media Studies, which she founded, shaped and guided for two decades. She was born in Germany in 1949, the daughter of Jewish parents who had met in exile during the war and returned to Germany. Miriam received her PhD in 1975 from Johann Wolfgang Goethe-Universität, Frankfurt, Germany, studying with Jurgen Habermas and Theodor Adorno during a turbulent era. She worked in English and American Literature and wrote a dissertation on Ezra Pound, but soon was drawn to the realm of film, writing on Alexander Kluge, with whom she closely interacted. Coming to the United States, she worked at the Whitney Humanity Center at Yale and taught at Rutgers University before coming to Chicago in 1990. Her research moved to the history of early American cinema and to the work of the Frankfurt school and its satellites on cinema. Both of these areas were evident in her book Babel and Babylon: Spectatorship in American Silent Cinema published in 1991, a work which gave shape to the research that had been emerging in the eighties on early American cinema, seeing it through the lens of Negt and Kluge’s concept of the public sphere, and providing a magisterial analysis of D. W. Griffith’s 1916 film Intolerance through the criticism of Walter Benjamin, and new work on gender. Hansen was able to work out an intersection between film history, film analysis and film theory few have ever matched. Her boundless curiosity marked her teaching and writing in the next decade, as she evolved the concept of the "vernacular modernism” through probing the influence of Hollywood on early Asian (especially Chinese) cinema, working with her student Zhen Zhang, and especially extending her research into the Frankfurt school and cinema, producing a series of crucial essays and finishing shortly before her death a large manuscript on cinema and the Frankfurt school. She had also hoped to do a smaller book on one of her favorite directors Max Ophuls, and last year had organized a conference at Chicago on New Media, reflecting a strong belief on her part that New Media, far from putting an end to cinema, continued its project of innervating human perception in new and even utopian ways. Although she had been battling cancer for the past decade, she continued new scholarly and theoretical work, and to mentor and advise students at the University of Chicago. She was committed both to the intellectual challenge that cinema posed for modern scholars and to its direct engagement with the senses (who else could write about how Jerry Lewis in Frank Tashlin’s Artists and Models relates to Clement Greenberg’s writings on American painting?) 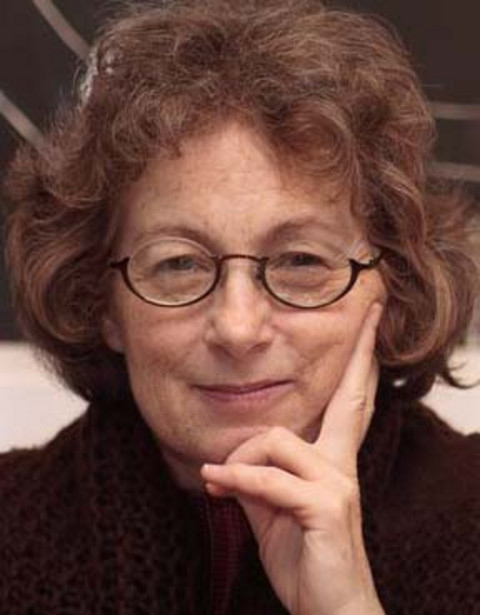 Her wit, her energy, her insight and rigor not only produced key concepts for our field, but provided the best of models for film studies at the moment that it moved from its pioneering focus on Grand Theory to a broader sense of a field that must include archival research, political perspectives, aesthetic awareness and theoretical ambition. We are devastated by her loss, but we all are better for having had her grace our field with her brilliance, breadth of perspective and elegance for a while. Un altro amico ci ha lasciati: lo storico del cinema gallese David Berry, autore del ponderoso Wales and Cinema: The First Hundred Years. Fino allo scorso ottobre, Dave è stato uno degli ospiti più fedeli (e discreti) delle Giornate (nella foto lo vediamo mentre entra in sala, al Verdi, nell'ottobre 2008). È lui che negli anni di Sacile, dal 2002 al 2005, ci ha fatto scoprire il cinema d'animazione inglese muto attraverso le birbonate di Jerry the Tyke, il cane creato da due proiezionisti di Cardiff, Sid Griffiths e Bert Bilby. It was very sad to learn from a touching e-mail written on Jan. 24 by his partner Gerhild Krebs that Dave Berry had passed away the day before: “Yesterday morning, his great soul full of laughter simply left a sick body to travel on - not altogether unexpectedly, but all too soon for those who knew his real worth. He will not return, because he has time and power unlimited now, for films, literature and sports." 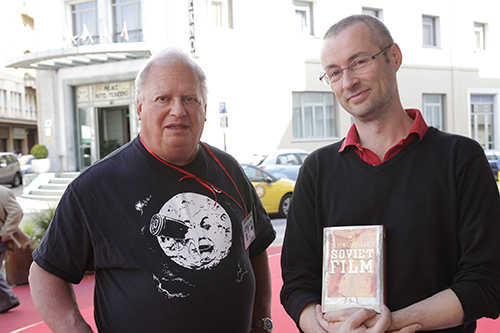 Dave was a free-lance film scholar, film critic for The South Wales Echo, Research Officer for the National Screen & Sound Archive of Wales, and until October 2009 a regular at the Giornate. We all remember him as a most discreet festival guest. And we owe him the discovery of a delightful character of silent British animation, the capricious canine Jerry the Tyke. 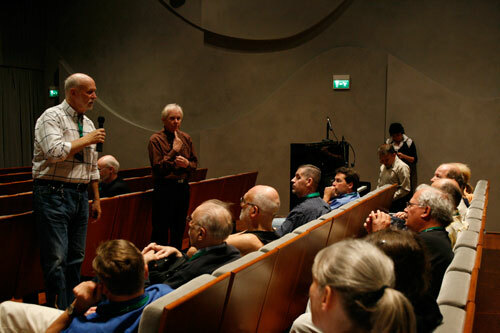 In the 2008 photo, taken inside the Verdi Theatre, Dave is standing on the right; in front of him, Gerhild Krebs talking with Bo Berglund. Pordenone, Ridotto del Verdi, 9.10.2007: Tom Trusky mentre presenta il DVD del film The Grub-Stake (1922), scritto e interpretato da Nell Shipman. / Tom Trusky introducing the screening of the DVD version of Nell Shipman's The Grub-Stake (1922). Tom Trusky, che nel 1987 ha fatto ri-scoprire alle Giornate del Cinema Muto la cineasta di origine canadese Nell Shipman, è morto improvvisamente il 28 novembre. Aveva 65 anni. Responsabile dell'Idaho Film Collection e direttore dell'Hemingway Western Studies Center della Boise State University, era un professore amatissimo (fu nominato per tre volte "professore dell'anno" dell'Idaho). Dopo il 1987 le Giornate ebbero il piacere di ospitarlo varie volte: l'ultima fu nel 2007, quando ci tenne a presentare personalmente il restauro digitale del magnum opus di Nell Shipman, The Grub-Stake (1922), e il documentario da lui firmato At Lionhead: Nell Shipman in Idaho, 1922-1925 (2007). Su Griffithiana sono usciti due suoi articoli collegati a proiezioni da lui suggerite alle Giornate: una biografia della Shipman (n. 32-33, 1988) e "Marilyn Monroe, il capo indiano Giuseppe e il Gosfilmofond" (n. 35-36, 1989), in cui racconta di come nella seconda metà degli anni Ottanta riuscì a ottenere dai sovietici due rulli di Told in the Hills, un film del 1919 girato in Idaho e considerato perduto. Tom Trusky, whose rediscovery of the Canadian-born filmmaker Nell Shipman was one of the highlights of the Giornate del Cinema Muto in 1987, died suddenly on 28 November at the age of 65. 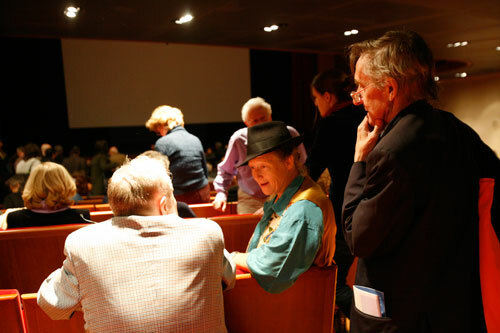 Head of the Idaho Film Collection and the director of the Hemingway Western Studies Center at Boise State University, he was a greatly loved professor (he was named Idaho's professor of the year three times). 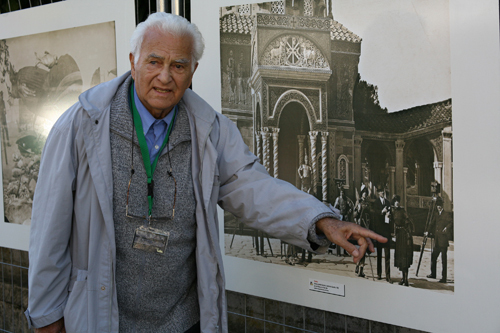 Since 1987 the Giornate had the pleasure of having him as a guest several times: the last occasion was in 2007, when he personally presented the digital restoration of Nell Shipman's magnum opus, The Grub-Stake (1922), and his own documentary At Lionhead: Nell Shipman in Idaho, 1922-1925 (2007). Griffithiana published two articles by him related to screenings he suggested to the Giornate: a biography of Nell Shipman (no. 32-33, 1988), and "Marilyn Monroe, Chief Joseph and Gosfilmofond" (no. 35-36, 1989), in which he told the story of how in the 1980s he succeeded in obtaining from the Soviets two reels of Told in the Hills, a 1919 film made in Idaho that was considered lost. 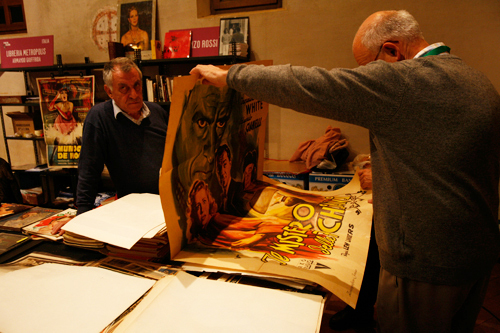 È morto a Trieste, il 24 aprile 2009, a 87 anni da poco compiuti, il cineoperatore Gianni Alberto Vitrotti, figlio del pioniere del cinema muto italiano Giovanni. Gianni Alberto fu fra gli operatori che documentarono le foibe e l'esodo degli Italiani dall'Istria: queste riprese sono state anche inserite nel film La città dolente (1949), restaurato nel 2008 dall’Istituto Luce in collaborazione con la Cineteca Nazionale e la Cineteca del Friuli. Nella foto, vediamo Vitrotti nel 2006, a Sacile, alle Giornate del Cinema Muto mentre indica una foto di scena del film Teodora (1922) cui aveva collaborato anche il padre.